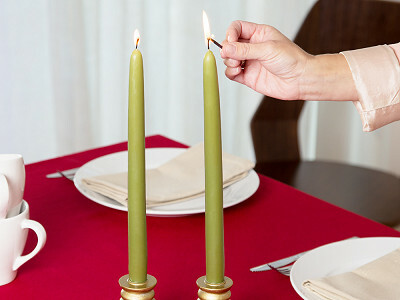 Bring some all-natural light to the table with unique beeswax candles. Big Dipper Candles are handmade in the USA from pure beeswax, which casts a soft, golden glow when lit. The aroma is very light and natural, and they last a surprisingly long time. Unlike other candles, these burn cleanly, and are non-toxic, non-allergenic, and soot-free. While burning, they release negative ions—which actually reduces pollutants and helps clean the air. A pair of the elegant tapers is the perfect dinner party accent, and the spherical candles feature eye-catching designs created by artists. 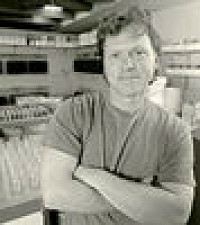 Founder Brent Roose began making candles all the way back in 1993, inspired by gazing up at the Big Dipper in the night sky. He’s still working with beeswax today, and pitches in to help support sustainable beekeeping, too. We think that’s the bee’s knees. Hap 'bee' Fall everyone! I am so excited to be a part of today's feature, Big Dipper Wax Works 100% beeswax candles. I love the opportunity to talk to everyone and anyone that will listen about why beeswax is the best choice of candles to burn. Our candles represent our ideals; to embrace good health and maintain a balance with nature. I look forward to talking to you more about what Big Dipper is all about and would love to answer any questions you may have! Because I have kids who inevitably run into the table where I have my candles...can you tell me about the wax and the ability to clean up spills? We have oil based candles that, if allowed to harden, will peel right off the carpeting, wood floor, and the wood of the cabinet itself without staining. I'd certainly prefer to use these Big Dipper Beeswax candles - but I don't see anything in the materials that indicate how easy these are to clean up. Can anyone advise? Many thanks! One of the things we couldn't fit into the video is how the Big Dipper candles do not lose their form, collapse, or become messy puddles as they burn down. I really avoid those kind of candles that can wreck your table or just become an annoying cleaning project. In fact, when I was testing four of the Big Dipper candles sitting directly on my dining room table, my teenage son commented (after about 8 hours of burning) "What is up with these candles? They have hardly burned down at all." Pretty rare for a teenager to notice something like that! I was writing my comment at the exact same time that Christine was asking about cleaning. Wild! Since mine did not cause cleanup issues, I am going to defer to Donna to answer about how to clean up accidental spills. Hi Christine! For cleanups, there are two different techniques you can use. If the wax drips on to a surface to where can't just peel the wax off (say carpet), what you want to first do is pick out the bigger pieces of wax. Then place a few paper towels over the area and iron over top of the paper towel. The heat from the iron will melt the wax and the paper towel will absorb it. You can also use this technique for any wax residue that the wax may leave after peeling it off a surface. Of course, please test a small area first to make sure that the heat will not damage whatever you are using the iron on. The other technique you can use is more effective for flat surfaces like a coffee table or dining room table. With this technique, you place ice to the wax. I do this by putting the ice in a plastic bag and then set the bag of ice on top of the wax. After the ice has been on the wax for five minutes or so, you should be able to easily peel off the wax from the surface you are removing it from. Hope that helps with any messes you have with wax in the future, Christine!! Thanks for your question. Thank you to everyone for their input/comments. I'm ready to place an order and give these a try! I'm very excited to get these and witness the glow for myself. ...and I've got my list started for Christmas gifts! We love, love, love these candles! (I'm NOT being paid or compensated in any way to say this.) Beyond the fact that conventional candles are so unhealthy for people and planet, we love the idea of supporting bees and a small company doing such great things. Big Dipper candles are just plain awesome from every aspect! these look brilliant! what size are they please?? thanks!! @kara driscoll: The Ornament candles are about 3" in diameter. The Artichoke and Tuscan Sphere candles are about 4" in diameter. I didn't realize that burning some candles released toxins. Thank you for en"light"ening me and for introducing these delightful candles. They will be beautiful for the holidays. Kate: I think a lot of people don't realize the candles they may be burning are not the best for your health. It's funny because we think so much about the food we put into our bodies, making sure that we eat well and take good care of ourselves. Sometimes we forget to think of other things that are also important, like our air quality! Beeswax candles (only 100% beeswax candles do this) actually emit negative ions into the air as they burn. These negative ions, much like rainstorms or seashores, cleanse the air. 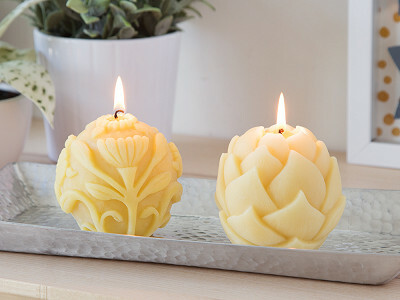 This is way burning beeswax candles are perfect for people with allergies or pets. Really cool, right?? 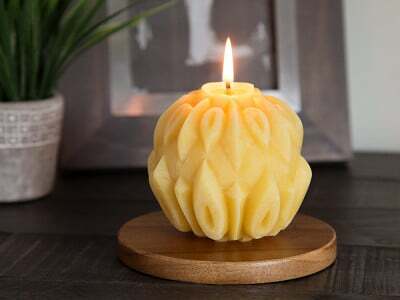 The Beeswax Tuscan Candle is even more beautiful than I imagined. The candle is bigger than expected and the design detail is exquisite. It comes in a beautiful box that only needs a ribbon for embellishment if giving as a gift. Inside, the candle is wrapped with red tissue paper, complimenting it's golden coloring. It comes with a little pack of matches. The candle burns for 50 hours. And because its Beeswax, it smells heavenly! You can even start to smell that lovely Beeswax smell as you open the mailer box. This candle is a perfect hostess gift and everything about it exceeded expectations. Thank you Daily Grommet for discovering it! @Carol Fishman Cohen: Thank you for stopping back to share your experience with your purchase! We are delighted that it exceeded your expectations! @Carol Fishman Cohen: This one is available again! 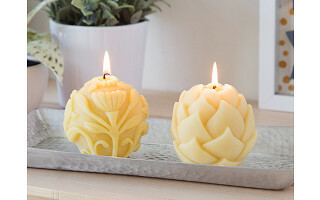 Do you have an idea of when the Beeswax artichoke candles will be back in stock? Really looking forward to those. @Christina Stachura: They haven't finalized their fall line yet. If the artichoke makes it into the line, they will be back in stock mid-late October. Hi! I keep checking back to see when these beautiful candles will be for sale again. "Early 2012"...does that mean soon, I hope? Thanks! @Jan Woods: We are hoping to have them back in stock in early February. Will the artichoke candle be in stock soon? @ Linda Yes, they will be in soon. Once we have tracking numbers (so we can knew the arrival date) we will post the date on the site and we will start to accept orders again.